In years gone by the build up to the FA Cup final would centre on the teams involved. The occasion and the prize on offer mean far more than the future of any manager. But, then, this hasn’t been any old season. Manchester United heads into the FA Cup final against Crystal Palace looking for the club’s first piece of major silverware since Sir Alex Ferguson retired in 2013. Three long years. While reaching the cup final is to be celebrated, there will be relief painted across United supporters’ faces come full-time on Saturday. The curtain will surely come down on Louis van Gaal’s era at Old Trafford. The Reds head into the FA Cup final almost two years to the day since Van Gaal was confirmed as the new United manager. The Dutchman claimed that his new side would “create history” and that “the challenge is always to come first, not fourth.” Two seasons on and Van Gaal was booed by home supporters after Tuesday night’s re-arranged game against Bournemouth. Van Gaal’s delusion has come full circle. “The fans expectations are too high,” claimed the veteran manager after another lacklustre performance. This was, after all, a Bournemouth side whose thoughts were already on the summer holidays. There is, of course, no denying that United fans have been spoilt over the last 30 years, but few would claim any divine right to success. Most want to be entertained and the love remains unconditional. However, the lack of ambition and excitement this season has hit fans hard. Harder still is an outdated manager criticising fans’ hopes and dreams. This from a man whose arrogant promises turned to dust amid the greatest fortune handed to any United manager. Still, the Dutchman has a chance to finish his career on a high. Reds fortunate enough to secure a ticket will enjoy a day out to remember in the world’s oldest cup competition. In recent years the cup has been devalued, with too many managers fielding weakened teams, while the prevailing sentiment has seen Arsenal mocked for winning the cup and claiming fourth in the past two seasons. Post Ferguson, United fans will take it. And thanks to an excellent marketing campaign, particularly from the BBC, the FA Cup has won back some its romance. United’s route to the final has been a shining light in an otherwise dark season. Indeed, United’s cup run has its own romantic aspect, with echoes of 1990. Ferguson was struggling at United having not won a trophy in three and a half years in charge. Lee Martin’s goal in the replayed final, against Saturday’s opponents Crystal Palace, changed everything and Ferguson went on to build a dynasty like no other. Few expect Van Gaal to build anything remotely similar. Most doubt he will be in the job come Monday morning. In addition to the manager, Saturday’s final is likely to be midfielder Michael Carrick’s last game for the Reds. The Geordie has made over 400 appearances in an 10-year period with the club. Carrick has won everything at United except the famous old trophy on offer this Saturday. Victory would be a fitting end for a wonderful servant and a fantastic player. Meanwhile, Saturday’s opposition has endured a mixed season. The Eagles began the campaign well and were in the running for a European spot. However, Palace’s form dipped dramatically after the new year, leaving the Alan Pardew’s side in 15th, only five points clear of the bottom three. Pardew’s side has kept just two clean sheets since the turn of the year, although it has knocked out four Premier League teams during the cup run. Little wonder Pardew is up for a “fight” at Wembley. Indeed, 1-0 is United’s most common result this season – it will receive short odds from the bookmakers this Saturday. United fans have dreamed of FA Cup success for some time, with the club’s last victory in the competition coming in 2004. Supporters have also been dreaming of Van Gaal’s departure. Both should be wrapped up by Monday. Van Gaal added to supporters’ anger on Friday when United’s traveling squad was confirmed. Memphis Depay and, in particular, Cameron Borthwick-Jackson can count themselves unlucky to be dropped from the squad, especially in favour of the injury-hit Phil Jones and the appalling Marcos Rojo. Antonio Valencia is set to keep his place at right-back despite mixed performances since returning from injury. This was clear on Tuesday night as the Ecuador captain frustrated and excited in equal measure. Chris Smalling and Daley Blind continue at centre back, while Rojo is hugely fortunate to come in for Borthwick-Jackson at left-back. Ex-Red Wilf Zaha will fancy his chances against the Argentinian. Carrick and Wayne Rooney continue in midfield after both performed well against an overly respectful Bournemouth on Tuesday. Rooney is looking to lift his first trophy as United captain and has hinted that he now sees his future in midfield. Many supporters see it on the bench. The returning Marouane Fellaini and winger Jesse Lingard compete for one place in midfield. The Warrington-born winger is better off the ball than on it, and his discipline could be useful against the attack-minded Pape Souare. Still, Fellaini could come back into the side after suspension, with Van Gaal concerned about Palace’s quality at set pieces. 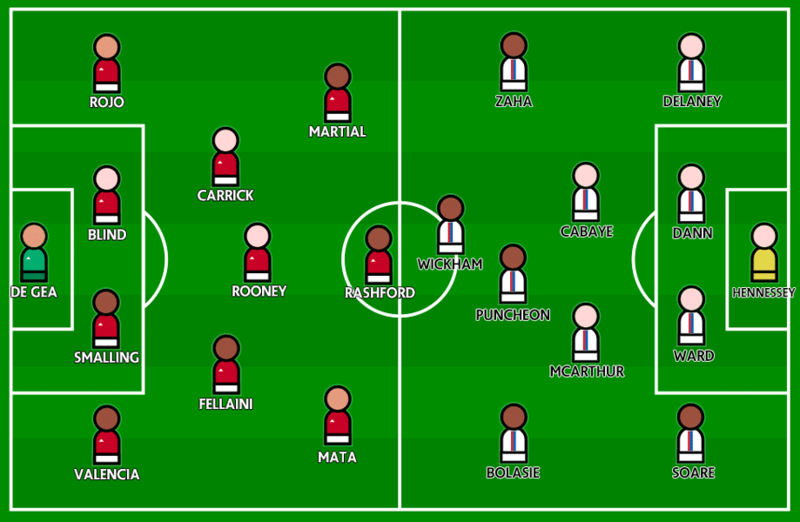 Juan Mata may again be consigned to the wing despite a good performance at 10 in midweek. Marcus Rashford continues up front. The striker was called into England’s Euro 2016 provisional squad on Monday, scored on Tuesday and should enjoy a profitable afternoon against a shaky Palace defence on Saturday. Rashford’s rise has been astronomical, and while many believe the European Championships may be too much too soon for the youngster, his performances have merited a first international cap. Regardless of the result at Wembley, the gossip come Monday morning will surely centre on Van Gaal’s future. It is irrelevant until 7.30pm on Saturday evening, of course, and then the blood-letting begins. Until then cup final day is something to be enjoyed. Scarlett ribbons at the ready, the famous Man United are going to Wembley!